I’ve mentioned the swallows nesting in our stable in passing on a couple of posts. They’re now on their second brood (on a second nest, atop a second light-fitting, for some reason – failure to find a valeting service locally, perhaps?). It’s astonishing that within a month or so those parents, and both new broods, will be making their way to South Africa. According to their usual natures, the first brood hung around the stable intermittently for about a week after thy fledged, but were then off about the skies elsewhere, fattening themselves up for crossing the globe by the age of a couple of months. unlike some more dutiful first broods, they haven’t assisted the parents with the second. One article on optimization (to be quoted in a later post, all being well) used the swallow’s wings as an example of a system that works “straight out of the box”. That’s apt – they get no training to speak of, yet they’re doing tight aerobatics for a living from Day 1, and transcontinental endurance flights from Month 2. The same could be said of their navigation system: a local told me that the second brood of their pair last year left on migration several weeks after the rest, presumably in order to get sufficient body weight. They found their way on their own, it appears. Remarkable when you consider that, from here, they have a seven mile flight to the coast, and then a hundred and twenty five miles of open sea to Europe. 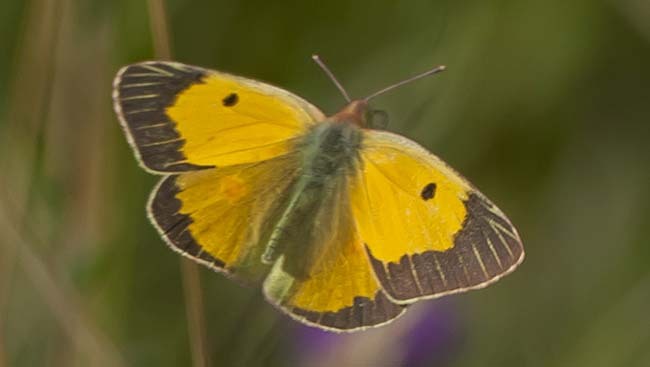 But yesterday, a possibly greater migratory survivor appeared in our paddock, in the form of a clouded yellow butterfly, Colias croceus – two inches of transcontinental aviator. It’s been the best year here for lepidoptera that I remember, with maybe twenty or so species spotted here at the Camel’s Eyrie (not bad for a temperate and industrialised country) but I’ve never seen a clouded yellow in over sixty years. Though I tell a lie – we saw one on the Greek island of Skiathos fourteen years ago, because that’s where they come from – southern Europe and North Africa. Yesterday’s little fellow (or it may have been a little gal) looked pretty dapper after such a long journey – remember that he’d finished his trip with 125 miles of English Channel, after perhaps starting it by crossing the Mediterranean. In all probability he or she will die here – breeding is rare in UK, and most broods that do occur succumb in the winter. But maybe even butterflies are in it for the sporting achievement, scorning the risk… well, no, I don’t believe that. And there’s no deep motivation for this post, except to wonder at the world we’ve been given – good to keep that in perspective. While I’m on the lepidoptera, I can’t resist posting this picture I took yesterday of a lime hawkmoth (Mimas tiliae) caterpillar. He won’t find many lime trees here, as they are a feature of parks mainly, not rural hill country, so has been munching on birch, probably – or hay perhaps, since we saw him crossing the stable yard. A nice defence of brandishing that bright blue horn and posing like a back-to-front bull – it scared me, anyway. It struck me what an effort it must be to have to think up two completely separate body plans, with entirely different liveries. In the case of the caterpillar, the fetching colour scheme isn’t down to sexual selection, anyway.